On Sunday, August 19, 2018, the Great Feast of the Transfiguration, Fr Ljubisa Brnjos celebrated the 22nd Anniversary of his Ordination to the Holy Priesthood in the joyous presence of his family and parishioners. We pray that God bestows upon him many years of health and happiness unto the service of our Church and it’s people! The Serbian Orthodox Church of The Venerable Mother Paraskeva, St. Petka, shows signs of marked progress in its construction and towards its greatly anticipated completion. 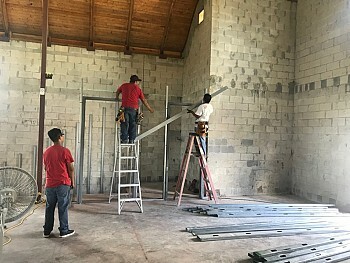 This church is being built in the traditional Serbian Byzantine style, by Fr Ljubisa together with his energetic parishioners, in honor of our beloved Serbian Saint and to God’s glory. We all rejoice in anticipation of the day of its consecration.